This text is the result of successive discoveries about the work and process of José Rufino. It is an attempt to re-integrate observations made about the “plastic art” structure and the “plasmic” structuring process seen as a progressive communion between the aesthetic and the ethic, with the aim of getting as close as possible to the aura that emanates from the physical and metaphysical nature of Rufino`s work. This text follows the same creative practice as the artist`s, a mix of assemblage and collage, an ordering of different moments and ideas that took shape alongside the very construction of his sculptures. In other words, the idea here is to make visible the multiple layers of meanings and references that imbue these works. It is impossible to cover all the components of Rufino`s creative system, but what is recorded here is a journey of sensations, perceptions and reflections which accompany this exhibition so aptly entitled Incertae Sedis - reading of the unreadable. During my very first contact with Rufino it was evident what the main issues in planning the exhibition at MAC-Niterói would be. From the outset there was a clear interest in creating a Plasmatio that involved a family of disappeared political activists from Niterói. Countless telephone conversations and correspondences served to enrich the material I had already researched about this Paraíba-born artist. But it was only while putting up the exhibition and closely following the production/creation process of the Niterói Plasmatio -from the search for and choice of used furniture stored in local authority and university depots to the unforgettable meeting with Lúcia Alves, daughter of Mario Alves, when she handed over papers and correspondence between her parents-that it really became possible to appreciate the highly complex realm of meanings that runs through Rufino`s work. This web of affective involvements that underlies his work operates like an invisible chain of links to existence, adding ethical and metaphysical depth. It is of great interest for a museum of contemporary art to have such close contact with such a process, because it is through this that artistic value and plasmic truth converge, with Rufino acting as agent. Rufino`s work defies any traditional introduction limited to formal, purely artistic values, when these fail to touch on its existential, ethical and, one could say, metaphysical power. His work, especially Plasmatio, is the result of the confluence of a series of apparently unrelated events, with the artist in the middle acting as alchemistagent, a “plasmator” of resignifying or re-energizing encounters between art and existence, past and present, creating a phenomenological unity between matter, memory and consciousness (perceptions and sensations). The metaphysics of Plasmatio is particularly anchored in the history of art through a rare constellation of artists³ who have a phenomenological approach to the use of organic objects and substances as different symbolical and metaphorical systems for internal human energy, as seen in the work of Joseph Beuys, Eva Hesse and Lygia Clark. When Plasmatio makes use of “useless” furniture, it draws closer to Joseph Beuys, particularly Fat Chair, 1963, associated to the human body; Rubberized Box, 1957, and Lavender Filter, 1961, as a system for spiritual purification. Beuys, who called himself a phenomenologist, was also keenly interested in Rudolf Steiner`s Anthroposophy, which was designed above all to reawaken spirituality in contemporary life. Beuys developed a symbolic, metaphysical system of combining objects with organic matter, felt, honey, lavender, fat, to create expressive forces to conduct human energy toward a process of cure - the body as the spirit in action. Beuys`s concern with human evolution, especially with the dominance of materialism and rationalism during the modern era, were inherited from Steiner. As of 1949, Beuys declared that it was the artist`s role to point out the traumas of an epoch and begin a process of cure. Along the same lines, Rufino has inherited from his great uncle this augmented critical view of existence, family and social relations governed by materialistic foundations. Even if Rufino took his name from his grandfather on his father`s side, it is from his great uncle, also on his father`s side, that he inherits his spiritual view of existence. He draws on this to create a work, Lacrymatio, which involves a process of cure in his own family, in which watered-down black ink drips down the representation of his family tree, made up of family pictures and documents. Unlike Beuys, Rufino puts his energy into the private world of human relations in which the sensible (4) energies accumulated in objects and documents circulate. His artistic interventions are applied to these, especially in the form of drawings and paintings using Rorschach inkblots. His sculptures composed with paintings, especially the Plasmatio series, are systems that transmute the private and social energies present in “sensible objects” (reference to Aristotle`s Parva Naturalia) that the artist comes across or chooses specially. This is where one can identify the sensible dimension of Rufino`s work, a strong existential outflow which goes beyond the positivist rationale that predominates the traditional approaches to the arts, bringing him closer to the critical concerns of another leading 20th century artist, Barnett Newman, and what he called “plasmic art”. Newman coined the term “plasmic image” in his writings during the 1940s (5) to refer to a new generation of painters who sought to transcend the objectivity “of the artistic elements” put forward by modern art, encapsulating (“plasmating”) in their symbolic visual production the expression of a subtle world of ideas connected to metaphysical concepts and philosophical principles. Rufino`s assemblages bring together Rorschach inkblot paintings on private documents and pieces of furniture bearing anonymous memories. They also draw on references of quite diverse natures, like Beuys and Newman, albeit both engaged in a quest for a metaphysical force for art. The Rorschach inkblots are truly “plasmic images” in the Barnett Newman sense, but in Rufino`s case they materialize organic presences that hover upon private documents wracked with longing and pain, not white canvases, the traditional format for painting. The format and structure used by Rufino, while providing a link to existence, are much more than mere artistic surfaces as they are for Beuys; they are actually the objects and remnants of affective journeys. In the last week mounting the exhibition, a number of separate events occurred simultaneously which lent the Niterói Plasmatio greater existential power. One of these was the donation of correspondences by Mario Alves, executed during the period of military repression thanks to a solid bond of trust established between Rufino and Lúcia Alves. Parallel to this, and quite by chance, after two unsuccessful visits to municipal furniture depots, we came across a physiotherapy couch cast away as if it were some “useless” object (falling apart) in the midst of countless other pieces of furniture inside a makeshift building at a public health center. The remains of Molina (6) arrived in Rio de Janeiro. The Tortura Nunca Mais movement, of which Lúcia Alves (7) is one of the national leaders, organized a tribute to him. Following up an invitation by Rufino, Lúcia paid a quick visit to the exhibition that was taking shape at MAC and was overwhelmed with enthusiasm, taking him off with her to the commemoration. Rufino later recounted how Lúcia introduced him to a number of leading members of the movement. We should recall at this point that Rufino has a family history of social engagement and struggle, and that his father was imprisoned during the military dictatorship; his mother, Marlene de Almeida, is also an internationally known artist. Thus, Rufino`s own life provides him with all the vital ingredients of memory, sensibility and kinship to translate the ethical and affective dimension of the frontiers between this movement and his art production; and even more so, between the remnants of past pain and the living presence of these people. 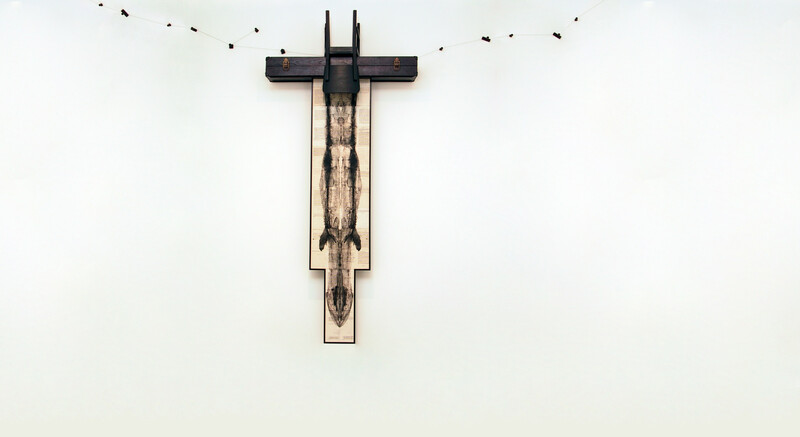 Rufino does not just relocate or appropriate documents bearing some other person`s memory to produce an assemblage of artistic effect; he produces a plasmic, machinic event that far exceeds what artist Barnett Newman proposed in the 1940s. Which takes us to Félix Guattari`s conceptual development of how new aesthetic paradigms emerge. According to this, reality is expanded by art, and in counterpart, art is expanded into existence, like a mutual movement of intensifying meanings. It was while I was accompanying the production of the Niterói Plasmatio that I gained access to this unseen dimension in the process, which sustains the links to reality and enhances the artistic experience`s capacity to give memories new meaning by nourishing it with ethical power. For as he brings documents of repressed memories to the primacy of sensible experience, these marks from the past are transferred to the energy of present time-the perceptions of form and sensations of an expanded field of meaning. By using this mechanism of bringing sensible objects from the past into the present through a new artistic existential construct of experience and subjetivation in the present space-time of art, Rufino translates Aristotle into his artistic practice-he gives new meaning of memory in perception. It was Rufino himself who pointed out the importance of Aristotle in his metaphysical investigations. The philosopher examines memory in Parva Naturalia (8): “First, then, we must comprehend what source of things are objects of memory; (...) It is impossible to remember the future, which is an object of conjecture or expectation (...) nor is there memory of the present, but only perception; for it is neither the future nor the past that we cognize by perception but only the present. But memory is of the past; no one could claim to remember the present while it is present..." It is in this route from memory to perception that the phenomenological dimension bound to the existential involvement of the artistic proposal is realized: the range and effectiveness of Rufino`s work expand to give new affective meaning to “traumatic" remnants of frozen memories. Longings and pains are given new life as substances for a public, social flow of artistic energies reordered from the senses by perception, which defy the critical positivism of reason. In his Plasmatios, Rufino manages to form organic reenergizing systems of worlds previously condemned to be isolated or clandestine. How many anonymous, unseen spheres are set in motion by the plasmic dimension and process hidden behind Rufino`s art assemblages, opening up black boxes of memory and making new sense of their contents through the sensible systems of multiple perceptions of art as experience? Museums make up part of the civilizing rituals related to tradition and the values of the Enlightenment. Anything that trespasses beyond the parameters of absolute universal knowledge controlled by reason and its statutes of knowledge still so tied to 17th century ideas represents a threat to the deterministic logical order of museums. Contemporary art and ideas make up part of a new order of emerging paradigms in art and our time, whereby indetermination and subjectivity are being reworked by artists whose structures are intentionally left open to the spectator`s participation. The museum is under challenge as a place of contemporary art by this organic statute of autopoietic rituals which rules over art practices for the primacy of the experience of expanded reality, in laboratories/territories for immersing the senses to achieve a multicentered perception. Rufino`s work is part of this new paradigm. And it in this way that it challenges MAC to be a womb for plasmatic rituals-of convergences between art and existence. On the day of the “ritual” opening of this exhibition at MAC, another “ritual” was also witnessed, in which Lúcia Alves consecrated the existential power of the Niterói Plasmatio, which is in perfect harmony with the emerging aesthetic paradigms put forward by Guattari, of art as an autopoietic, “machinic” event" (9). This work was magnetized by the almost cathartic experience of Lúcia under the impact of her first new encounter with her family papers after they had been combined with the Rorschach painting, forming the Plasrnatio exhibited in the exhibition. From that moment on, the museum itself became a fecund territory for empowering subjectivities, a place where “territorialised assemblages of enunciation (p.99) (10)” can be ritualized, legitimizing the plasmatory dimension of Rufino`s work of creation in nascent state. With Plasmatio, and around it, a different type of ritual was pronounced that night, putting Lucia in a state in which she herself could give new meaning to her memory objects, which were taking on new meaning as part of an artistic system of perception expanded to autopoiesis, since it involved her own existential passage to beyond. Lucia`s public act before the work gave witness to its plasmatic power to liberate a traumatic memory and project it as an heroic act, an overcoming of clandestine ways and means to an experience open to the social and collective. At that moment the animistic, metaphysical dimension of Rufino`s work was revealed, enabling Lúcia to experience a hybrid unfolding of pain into joy, from private memory into public perception. The similarity of the piece and the situation with the image of people standing round an autopsy table was evident; yet it was not the body of Mario Alves that lay there, but letters of torture and longing signed by a hand shaking with longing. However, what actually lay upon this piece of furniture cast away as useless, a (former) physiotherapy couch that was come across by chance, was an uncanny painting, conjuring up an imaginary entity from the inkblots of a special Rorschach. From that evening on, essentially thanks to this ritual, a contravention of the fine arts and museums can be shared through the realization of a “plasmic art” ritual: the art manifestation has been reterritorialized as a catalyzing machine for flows of Plasmatio. Its effectiveness was confirmed: reconnecting art to existences and concrete lives, from memory to the primacy of perception, and from then on offering itself up as a social exercise in the aesthetic and cognitive experience of feeling. Its power transcends from the static form to reconnect with the existential, attaining its alchemic, machinic (11) climax (autopoietic machine), whose substance-force is always twofold and complex, spanning the physical and metaphysical, the artistic and the plasmic. The ritual-installation Plasmatio gives the very space of the museum new meaning, granting it a metaphysical atmosphere that seeps into the positivist statute of scientific knowledge that rules over formalist aesthetic principles. With this, a place has emerged in the museum for the countless things to come, of a present creation of meanings and subjectivities, in other words, of autopoiesis. Rufino`s work is like a field action, the vibrating, plasmating source of a soul itself; through its multiple synergies with the soul of the place, both are given new meaning. This aesthetic paradigm which is emerging with Plasmatio`s materiality and metaphysics defies the museum institution to adapt itself so it can be the agent (assemblage) of new rituals of local significance; as Guattari comments, “the movement of infinity; an abstract, machinic transversality articulating the multitudes of finite interfaces… or plane of consistency, a multiplication and particularization of nuclei of autopoietic consistency (existential territories).”(12) As a museum of contemporary art, MAC must focus on understanding or absorbing “poetics of infinity”, or what Guattari calls movements of infinity, places of experience, laboratories for reconnecting infinite interfaces, respecting the potential associations that each artwork carries as machinic sources for setting up existential territories that are historically distanced or alienated from museums. Rufino`s work impregnates the actual identity of the museum before its paradox, bringing up paradigms still in formation that have much to do with Guattari`s reflections on “emerging territorialized assemblages”. “These objectivities-subjectvities are led to work for themselves, to incarnate themselves as an animist nucleous; they overlap each other, and invade each other to become collective entities half-thing half-soul, half-man half-beast, machine and flux, matter and sign...”. (13) Rufino gives us a glimpse of the chance to realize the process-oriented aesthetic paradigm that Guattari sets out so well under the title of Chaosmosis: the emerging aesthetic potential is elevated to a universal verticalizing dimension, completely in tune with the local, territorialized, ethical commitment. The existential bonds of affection built up during the process of constructing the Plasmatio are important building blocks for Rufino`s work to take on its metaphysical aspect, to acquire a soul and merge with sensible objects, full of intrinsic involvements between so many personal histories, under a new identity of psychosocial sculpture. What lies behind the strange creation-constructions of José Rufino`s artistic imagination? These works appear to start out from an initial question - whether the private memories of old things are fixed and impregnated in each object or if they are fluid and volatile like plasmas, and whether objects themselves can be given new meaning through the action of a paleontologistartist, triggering an immediate perception of the present moment and awakening a different flow of intuitive memories in each spectator. These artistic processes of Rufino`s, appropriating and “assembling” used objects, invoke the same power of synthesis as the muses in the art of Calliope (14) and the poetry of Aristotle, sublimating the potency of past memories through the transformational power of the poetic experience of the present moment. Remote as we may be from the temples of the Greek muses, we are led by Rufino to cross-culturally reassess the underlying or universal nature of the role of art to collectively distill human experience, giving new meaning to the weight of private memories and the political and social histories accumulated by individuals and families through current-day rites of meetings and exchanges shared with symbolic, poetic and aesthetic forces. From naming each work in Latin to the titles` association with bodily purges, especially those of the sensory glands of the human body; from the use of the Rorschach inkblots on personal documents to the references to Justinus Kerner - all these go to reveal a system of “spiritual” forces that reaches out beyond the visible world in a work whose major impact is somewhere between physical and metaphysical. Maybe it is in this quest to achieve a transcendental capacity for his work to invoke metaphysical presences that Rufino makes use of such dense references, starting with Aristotle. Rufino cites Aristotle as one of his main sources in composing Respiratio. In De Anima, Parva Naturalia, Aristotle develops a treatise about the soul, memory, feelings and sensible objects, and especially studies info the nature of the living body, particularly breathing, inhaling and exhaling. This comment of Rufino`s also sheds light on the origin of the artist`s process of naming his works with Latin titles which refer to the organic attributes of the human body. By taking Aristotle`s enquiries, Rufino traces a middle way between a philosophical approach and a scientific one: his own path between paleontology and art, the basis of his search for a confluence between aesthetics and existence, sensible objects and form-matter as life-giving substances-art, body and soul. And his works defy these boundaries. When Rufino treats things as sensible objects or extensions of the senses, his work takes on an organic dimension, like an organism capable of invoking presences. This may be why Aristotle is such an important key to understanding the origin of his Plasmatios. Rufino says that it was after he read Aristotle`s treatises that he developed his first series of assemblages with drawers and plaster bubbles called Respiratio. Things do not breath, only bodies with a soul, Aristotle writes. The proximity Rufino has to the philosopher`s enquires is startling. And thanks to this, everything in his works gains attributes that link body and soul. First of all, breathing is taken as one of the main features of living beings. Likewise, living beings are bound to pleasure and pain, life and death, just as inhaling and exhaling are part of the natural cycle of breathing. Aristotle also has insightful things to say about the issues of matter, memory and healing, all of which are so essential to Rufino`s existential aesthetic and so distant from the critical universe engaged in contemporary art production. But it is for its metaphysical nature that Rufino`s work stands out. The route he is taking is singularly rich, because it has split ranks with the contingency of the vanguards, nor is it imbued with some belief in revolution through art. The beauty of his work also conjures up the words of Aristotle: “We regard all knowledge as beautiful and valuable, but one kind more so than another, either in virtue of its accuracy, or because it relates to higher and more wonderful things. On both these counts it is reasonable to regard the inquiry concerning the soul as of the first importance. ”(15) Rufino`s works are supreme because they tackle questions or invocations about the soul and the sense of existence. Each work has its own enigmatic organization which defies the natural logic of the sense of things. It is the viewer`s job to find his bearings within this laboratory of experiences through the phenomenology of silence, crossing an expanded field between matter, memory and consciousness, to exercise his right of autopoiesis, of reading and creating himself as an extension of his imaginative perceptions set in motion in the world. The Rorschach inkblots applied to documents imbued with longing and historical gravity impregnate the rich system of signs in each work with metaphysical layers. At MAC, Rufino`s sculptures have become environmental events, causing new relations to be drawn that go beyond the mere juxtaposition of different things, inkblot-drawings and documents, to reach their climax as organisms that plasmate highly ambiguous atmospheres. One might say that there is a phenomenology of perceptions that seeps into each stage of Rufino`s creations, from their development to their reception by the public. Each assemblage is the result of a convergence of intuitive impulses and encounters amongst people, histories and objects. And parallel to this, in one single structure, Rufino coordinates his own influences and sensible involvements with the people connected to these documents of recollections and longings, papers and old furniture, until he reaches the moment when he performs the purge-print of a Rorschach inkblot. Likewise, to receive these works one needs an expanded perception that demands a state of awareness much like that of the paleontologist who comes across a totally unknown fossil. The works trigger an uncanny feeling, intuition, and activate the memories lying dormant in each element of the installation, mediated by the senses. These are installations composed of used objects with many stories to tell, many latent memories. It is of no interest to know the precise historical origin of the individual parts of each set. What José Rufino`s does is to give the remnants of past stories new destinies, new meanings, which nourish the creative life of the mind through artistic experience. To receive his work is to let it in through the senses, through multiple entry points, leading to new understandings about ourselves and our place in the world, far beyond mere appearances. And is this not the most important role of each artist in his time? Rufino does not fix memories to the things themselves, but puts them at the threshold between perception and phenomenology of the consciousness, which penetrates into and is permeated by everything it has contact with. Yet his route is inspired by a poetic state in which imagination recaptures particular memories for history. Rufino`s is the less-worn path taken by those artists who, through chaosmic impact, manage to stir up the layers of private and public memories and histories deposited or imprisoned in mixed sediments of longing and pain. He gives back to art what history has buried in silence José Rufino does this to subvert the natural order, shifting objects discarded as useless from the real world into the art world. The scientific name Incertae Sedis (that which has no classification) that José Rufino gives this exhibition is a clue to appreciating and understanding the trail of works and environmental installations whose greatest peculiarity is the way they transgress scientific processes and methods by constructing new orders and systems of things that only belong in and can only exist for the art world. For as artist and paleontologist, Rufino is engaged in discovering and remaking times and memories, naming creations and inventions. These two routes of science and art are interlinked, especially in Rufino. Paleontologists and artists share the experience of contact with creation and discoveries of primal relationships between the time of life`s beginnings and the interpretation/invention of realities which form and transform the meaning of life. In their quest for reason and/or the curves of the imagination, both put together their finds, fossils or clues and footprints from an unknown past in anticipation of the future, drawing the materiality and immateriality of existence ever closer together. Rufino`s right to name each of his completed artworks is, thus, similar to the paleontologist`s naming and classifying a previously unseen fossil. Both deal with a primal encounter free of any pre-existing scientific reference, as defined by Incertae Sedis. It is from this sense of awakened curiosity that the transformational new meanings and readings are revealed for the remnants of past existences, seen through the eye of the conscious present. Rufino`s studio is something like a field for uncovering different archaeological layers, merged with recent histories/memories. In it, feelings are mixed from the past to the future, or from the future to the past, in a single flow of present continuous time. However, in this crossroads between science and art, there are also pronounced differences. The paleontologist seeks order and categories to reconfigure his treasures and clues, explanations about the origin of life in distant worlds and times, through systems of classification (taxonomy) for fossils. Meanwhile, the artist, particularly in the 20th century, seeks to give present time the power to assimilate both past and future, revealing to present consciousness a memory that is not fixed, but which forms a constantly flowing undercurrent, like an underground river, for the appearance of the commonplace things that make up our daily lives. As Rufino himself has said, the artist does not try to reconstruct the past, as a paleontologist would like to, but he brings together all times, past and future, in a primal, present moment. This is where Rufino`s art production can be studied through contemporary cognitive theories, where each observer is a participant, cross-fertilizing with his/her own projections the readings of an artwork, which in turn reacts like an open field of multiple meanings. Each of Rufino`s works is primal, a new being, imbued with humanity – “a sensible machine” - which is put together for existence (each exhibition), breaking through all natural orders and traditional categories for classifying the history of art. In the presence of Rufino`s work it is impossible to carry on viewing commonplace things in terms of systems and fixed orders of meanings and interpretations; his production - arguably some surrealist hallucination or dadaist occupation - overcomes any scientific or natural order and invokes an uncanny, disorienting feel with each new experience. Thus, each of his inventions has a special name, because each one has come into being from an artistic invention or intuition. The names Plasmatio, Sudoratio and Lacrymatio seem to come from some fictitious scientific classification. Rufino devises imaginary time machines which initially put one off balance, that drive perception onto an imaginative plane. The results are not so much scientific outflows as artistic ones; yet, as there is no line between sculpture, painting, drawing and poetry, they also transgress the traditional categories of art. This is why the name Incertae Sedis is so apt for referring to a primal experience of many senses, as we are caught up, like Alice, in a strange, curious land of wonders. When we enter the world through the looking glass, “there`s the room you can see through the glass - that`s just the same as our drawing-room, only the things go the other way.” Rufino`s suggestive title, Incertae Sedis, invites us to journey through an imaginary, uncanny world made up of absent beings, specters of haunting presences, lost-time machines, with no classification. This land of Rufino`s is also disorienting because, like Alice, we still recognize tables, chairs, cases, letters, but everything “goes the other way”. Alice`s adventure is also the artist`s and paleontologist`s adventure, passing through the veil of appearances, beholding objects as instigating primal journeys through time and the senses in uncanny orders that subvert original meanings. This exhibition shows every visitor interpreter a way to attain the experience of a state of poetic expansion as they move between the world of memory and the world of imagination, between the fiction and concrete reality of things. Classifying animal and vegetable fossils, comparing this with that, the similar and the different, are all intellectual attributes for the life of a paleontology researcher, a university professor, like José Rufino. In investigating fossil finds and even footprints to identify traces of the origin and environmental conditions for life in a long-distant past, the methodical observation of precious, rare, vital remnants has much in common with the exercise of speculative thinking and intuitive perception. It is with this intense practice of handling sediments from the past to imaginatively reconstruct worlds faded in the past that Rufino brings to attention the instigating schism in the dominion of the logic of reason, to be replaced by another order, the poetic impulse which gives new meaning, transfigures and alchemizes the things by which memories emerge. Poet-artist Rufino rescues the scientist from his overwhelming desire to decode, describe or retell the past. Thus, as Chesterton declares, “Poets do not go mad but chess players do. Mathematicians go mad, and cashiers; but creative artists seldom. I am not attacking logic: I only say that this danger does lie in logic, not in imagination.” (16) The potency of artistic liberty can contain the paradoxes of the past and future without trying to solve them, as science does, just relocating them to human consciousness, giving them new meaning through poetic, aesthetic experiences. The same route as Rufino`s is opened up for the illustrious visitor: the appeal not to interpret whys and wherefores in these works, but to be willing to take the same journey from paleontologist to artist-poet, a journey of imagination capable of building new worlds and new orders for thinking, feeling and behaving. Nonetheless, we cannot fail to recall the extent to which these interventions of Rufino`s are grounded in both his personal history and the history of art, like the dadaists` and surrealists` devices, which conjure up immediate memories. They may make reference to Duchamp`s practices of the imaginary, to early 20th century assemblages or to Joseph Beuys`s installations and material alchemy. But Rufino is totally centered on his own particular, cultural route, involving his family life, bound on the one hand to the art world and on the other, through his parents, to political engagements that engendered threats and persecution. In Recife in the 1980s, Rufino became involved with the movements and activism of Paulo Bruscki, Daniel Santiago, Jomar Muniz de Brito - Recife-based dramatist and cultural agitator - and poet Augusto dos Anjos. At this time he had ties with the anarchy movement and MR-8, while he also took part in the alternative postal art. At the end of the 1980s he became involved with a group of poets and travelers from Recife. The works draw us thus into a state of meditation about existence, but, according to a phenomenological order, the passing of time and loved ones, distance and presence are part of an intersubjectivity or interpenetration between the visible and invisible. Such meditations on existence are nothing new to the history of art. Take, for example, the existential questionings recurrent in the history of European painting since the 17th century. Objects like books, flowers, fruits, dead animals and skulls were composed as allegories for the confrontation between art, eternity and the constant awareness of the superficial and ephemeral nature of life. Rufino once mentioned the inscription “memento mori” he came across on Igreja da Guia church in João Pessoa, which so attracted his attention. The medieval expression is a reminder that life is finite. 2 Quoted by Richard Ford in the New York Times on September 4, 2005. 3 Certainly, when we talk about an existential aesthetic, which seeks out art`s effectiveness in activating the process of relations with reality through expanded perception (whether individual or social, physical or metaphysical), who immediately come to mind are a solid lineage of artists from the 20th century, like Joseph Beuys and Lygia Clark. Barnett Newman and Rothko`s generation sought routes for plasrnic art through painting. Ana Mandieta took a more radical route in the search for ritualistic roots in her cultural heritage. In Brazil over the last thirty years one can interlink different poetic languages and generations in one line that seeks to draw close to existence directly, including Barrio, Tunga, Cildo Meireles and Farnese. Special reference should also be made to the path taken by Nelson Felix. 4 Translator`s note: the word “sensibly” is used throughout for the many references to the senses, taking as its root the classic translation of Aristotle`s work. 5 NEWMAN, Barnett. Selected Writings and interviews. Berkeley and Los Angeles, University of California Press, 1992. 6 Molina was another leading figure who resisted the military dictatorship, who also “disappeared” and was executed by the regime. His remains were found in São Paulo and transferred to Rio de Janeiro this very week. Tortura Nunca Mais, an anti-torture movement, organized a tribute to him. 7 Lúcia Alves is the daughter of Mario Alves, a journalist who was imprisoned and tortured to death. She lives in Camboinhas, Niterói. 8 ARISTOTLE. On the Soul, Parva Naturalia, On Breath. London, Harvard University Press, 1995. Translation by W.S, Hett. 9 GUATTARI, Félix. Caosmose. Um novo paradigma estético. Rio de Janeiro, Editora 34, 1992. 10 GUATTARI, Felix. Chaosmosis. An ethico-aesthetic paradigm. USA. Indiana University Press, 1995. 15 ARISTOTLE. On the Soul. Parva Naturalia. On Breath. Loeb Classical Library. Translated by W. S. Hett. Harward University Press. London, 1936. Reprinted in 2000. 16 WALLACE, David Foster. Everything and Mare. A Compact History of Infinity. USA, W.W. Norton ? Company, Atlas Book, 2003. Quotation by G.K. Chesterton on page 6. 17 Although Rufino tends to appropriate used objects, his assemblages also bring together images that are strongly impregnated with medieval magic or alchemy. These ink blots, to use the language of psychoanalysis, are the result of a technique discovered by chance by German doctor Justinus Kerner (1786-1862). When ink is applied to just one side of a sheet of paper and the paper is folded then unfolded, it takes on symmetrical shapes that are extremely curious, discovered by chance with no intended control. Throughout the 20th century, the technique became known as Rorschach, due to Swiss Hermann Rorschach, who developed a psychoanalytical test based on the interpretation of these ink blots. 18 The first schisms in modern art in the 20th century can be marked as the end of the representation of reality in painting. However, spiritual questions and existential or transcendental meditations accompanied the main artistic transformations of the 20th century. Still life receded as an illusionist technique of figurative painting, giving way to a direct approach to the unknown universe of expression of mental or spiritual life, which broke from expressionism to abstraction between 1906 and 1920, with Wassily Kandinsky, Frantisek Kupka, Piet Mondrian and Kazimir Malevich leading the way. Concurrently, Picasso`s and Braque`s Cubism deconstructed the artistic virtuosity of the still life in geometric grids and collages of labels and newspapers. An these creative forces were only liberated from the autonomy of painting by the split from illusionist representation of a given reality, becoming forces for activating consciousness in a chaotic world. The artist`s creative act, as Duchamp shows so well, was guided by the newly awakened participative involvement of the spectator in the work`s space-time, open to expanded perception before the immediate reality of the artistic experience. This was one essence of the public reception of art that was strengthened throughout the 1 940s, as the number of existentialist and phenomenologistic approaches to philosophy and literature multiplied during a period of world wars. Art started to seem more ambiguous and subjective, because at the same time that it was concrete and immediate, its was set in motion by the interaction of each individual - it became a field for developing interpreting subjects which construct themselves through the action of multiple senses. Texto para o Catálogo da exposição de José Rufino, Incertae Sedis, no MAC/Niterói em 2006, com curadoria de Claudia Saldanha e Luiz Guilherme Vergara.